← Coconut Cream Pie For Jakey Boy! Whenever I’m preparing to leave town for a length of time, one of the hardest tasks for me is to somehow cook all the produce and perishables that cannot be frozen. I don’t like wasting fresh vegetables and fruits, or dairy products for that matter. It’s a fine dance and my meals become very creative … and often a little weird. The other week I opened the vegetable drawer and realized I had a lot of organic, beautiful carrots that needed a home. I also had a quart of homemade chicken stock, although you could use canned stock or even “better than bouillon” too. It was cold outside so I immediately thought of carrot soup, more the vegetable-only, forget-the-meat variety. But for whatever reason I did not fancy a pureed, smooth or blended soup. I wanted something more chunky – something with some texture. And voila! I basically took one of my pureed carrot soup recipes and took out the “blend with a stick blender” step. This was so yummy and a little different spin on carrot soup. FYI – I am going to try it next time with a cup of coconut milk and cilantro in lieu of dill. You could dollop some crème fraîche or greek yogurt to serve it, but I wanted it simple and plain. This is one of those “cannot fail” type recipes – just minimal chopping and 45 minutes on the stovetop. 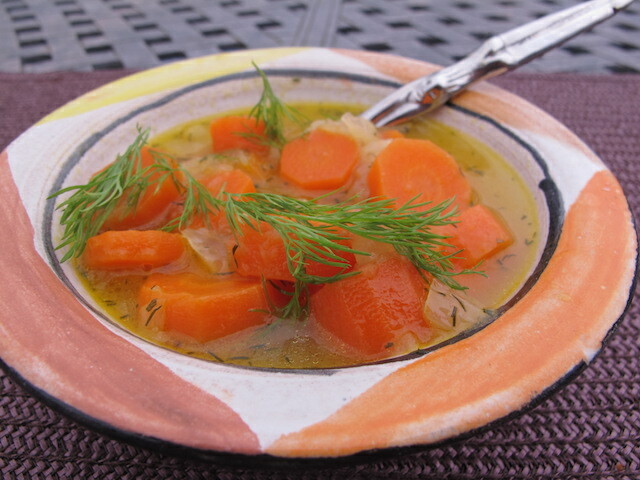 The sweetness of the slowly cooked onion and carrots provide a delicate balance with the chicken broth. My husband gave it a huge thumbs up, but don’t trust his judgment because he is a huge fan of my creations. Go for it! Heat a 4-quart sauce pan and add the butter. Once it melts, add the diced onions and dry dill and let them cook on medium low heat, stirring occasionally, for 10 minutes. Add the carrots and cook for five minutes, stirring occasionally. Pour in the chicken broth and turn the heat to high. Bring to a boil and then reduce the heat to low simmer, add the salt, and simmer for a half hour. Leave the pot uncovered during the cooking process. Serve with a few dill fronds or chopped herbs. Enjoy! This entry was posted in Soups, Vegetables and tagged Carrot Soup. Bookmark the permalink.